Master James Kemthong Had stayed in the south for several months and There was a definitely a powerful feeling right away among his followers. He had been to Chumphon, Surat Thani, Krabi , Phang Nga and Phuket, even the Gulf areas of Surat Thani which in the past had been a resident of the old terrorist and The communist was the founding and ruling political party of the People in various districts of this area but Master James was never afraid of danger. He was regarded by the world as an urban legend of a Master of mysterious Thai Tattoo. All Yan are strictly Buddhist, element from Traditional Thai culture, as the purpose to achieve a broad spectrum of results. These may bring prosperity to a business, to more spiritual purposes, such as sanctifying a Buddha image for worship. The most common applications in Thailand are for protection, love, wealth and luck. Although generally utilized as preventative or remedial measures, Yan can also be very specific for tattoo people. Even many of Chief Executive of the SAO who are owners of large plantation in the south came as students to Master James Kemthong tattooing on their body. They have many experiences of their henchman who came to tattooing by master James for example; There are many people who drive on expensive cars , the car collided with a large tree and the car was demolished , but the driver was not anything so the rumor around the market Khian Sa District, Surat Thani . In the other case, the man was shot while driving in broad daylight but he could escape safely, there was nothing harmed him and in his body had just only Yantras by Master James. Some people had come for tattooing with Master James after that their family life were better than ever and the problem in their family had gone away only found with happy faces in family. The power of any amulet or tattoo by Master James increases with time. However the broad spread wide out much like a double-edged sword, “Charismatic of the devil does not just prestige” This is the truth. The act of defamation; calumny, slander, or libel from some envy people co-operated to make as well as a black magic through Master James in order to clear and destroyed Master James down. One night, When Master James did both practices of meditation and chanting after midnight Then there were solid objects falling on the roof of the residence several times along with a voice loud with singing owl flying sequences around the property and hold on the tree .The pupil of the professor was surprised that in the late of night why there are many birds around here so that they could not sleep with loud but Master James did not fear anything. He did both practices of meditation and chanting as usual until sunrise. In the morning his students asked Master James that how did he sleep last night his students could not sleep all night long because of birds singing most of the night, Master James did not say anything more he was saying only that he worships Buddha and did meditation every night before bedtime. 1. Metta : loving-kindness towards all; the hope that a person will be well; loving kindness is the wish that all sentient beings, without any exception, be happy. 2. Karuna: compassion; the hope that a person's sufferings will diminish; compassion is the wish for all sentient beings to be free from suffering. 3. Mudita: altruistic joy in the accomplishments of a person, oneself or other; sympathetic joy is the wholesome attitude of rejoicing in the happiness and virtues of all sentient beings. 4. Upekkha: equanimity, or learning to accept both loss and gain, praise and blame, success and failure with detachment, equally, for oneself and for others. Equanimity means not to distinguish between friend, enemy or stranger, but to regard every sentient being as equal. It is a clear-minded tranquil state of mind - not being overpowered by delusions, mental dullness or agitation. And recalling the obligation of teachers so the forces of evil become confused on the way to his house. The villagers were misled to believe a dark magic group, this made them to become an extremely unattractive economic proposition foe even the most destitute rag picker, some families had drama and estrangement. Finally returned to ask for the Master James helping then their life were better in order. With the power of the Buddha, Dharma, Sangha in action, live life with full conscious, act of kindness, God will always protect your heart wherever you go. Master James Khemthong had traveled to the north of Thailand and located the tattooing Bureau in Maerim Chiang Mai for many years untill he had a lot of followers such as governors, soldiers, polices, traders, business men and general people. Moreover, he had followers from aboard in many countries Those who were faithful and asked to be Yantra tattooing people of Master James and also had many famous acters,actresses came and were tattooing by Master James Khemthong. 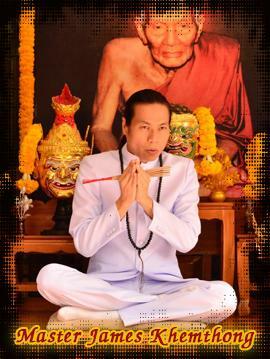 Over the years, Master James Khemthong had Yantra tattooing and Kob Sian Kroo which is the ceremony that Master James lay the unique mask of the Guru Master on the head of followers as a blessing, Kob Kroo is performed once a year in October,23. There were more and more followers in each year and every years there were new life experiences from the followers relayed to Master James for all about better life in luck, love and wealth.